When shoppers bring in their own bags to carry their items home in, it reduces the number of non-biodegradable plastic bags. Personally I have been wanting to get some reusable bags for some time now. I am tired of the plastic and paper bags cluttering up my garage and polluting our community (and our world in general). So when my local grocery store started offering these bright green reusable shopping bags for just 99 cents each I was delighted. These bags are very durable, flat bottomed and can hold as much as much as 3 times what a plastic sack would. Now these bags in particular were not being sold as a fundraiser, just as a promotion for the store. In fact the grocery store offers 5 cents off when you bring them in. Not much, but it’s a nice touch. First I like to see a company who is selling a product not just make a buck but because of a driving principle. InStore Products Ltd. out of Ontario impresses me as being very committed to reducing pollution. Their website BringYourBag.com is professional and educational with statistics about plastic bag use and what impact reusable bags could have. According to the calculator (left hand side of the screen, scroll down) an average person will take their shopping home in 250 plastic bags per year! First to use these as a fundraiser the bags need to have attractive pricing, both the wholesale cost for the non-profit agency and a good price for the consumer. I’ve seen bags from other companies that have suggested retail of $10-20 which even for a fundraiser is a bit pricey. This high pricing will be a turn-off for some people. A product sales fundraiser has to be something that people really want and need. The general public is becoming more and more interested in actions that will help preserve our earth. Using these bags instead of plastic or paper bags that will end up in a landfill is one of the easiest ways to do something. Retailers also have an incentive to promote these bags. If customers bring their own bags the stores save thousands of dollars per year in costs. I talked with John at InStore Products Ltd. and he said that they have provided the bags to several charities as a fundraiser. They will sell them in bulk to your group at less than $1 per bag and you can sell them for $2-5. This might not sound like a lot raised per bag but this way more people can purchase them and can get several of them. 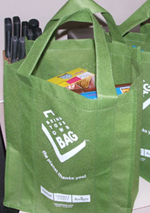 Most families will need at least 2-6 bags if they plan on using them at the grocery store. This would be a great way for a retailer and large organization, such as a school, to partner for mutual benefit. For example, by using school colors and logo it’s a spirit item. If the store and/or other retailers put their logo on them its a publicity item. It could be a co-branded promotion where both the store and the charity logos are on the bags. The minimum order for custom imprints is 5,000 but they also have stock bags for those needing lower quantities. As I mentioned each bag will only bring in a dollar or two, so you will need to set a goal for the number of bags you want to sell in order to meet a fundraising goal. Keep in mind that in addition to the funds raised you are raising awareness about your cause and providing a way for people to do something good for the environment. The biggest drawback I can see with this project is the potential competition. Just today I was running errands and saw reusable bags on sale at two other stores in addition to the grocery where I bought mine. They were also selling for $1-2. The difference I can see though is that those stores are not actively promoting them like the grocery was. Of course they were also not benefiting any charity. If your organization got behind this as a big campaign then you could be quite successful with it. Just be sure to be the first and/or biggest group in your area doing this program. If several organizations and stores can partner together it would boost your chance of success. I like it and will be sure to support it! Sandra, yes Im in euros, so what is that in $, Im not sure? I really like the fact that the government here are charging a levy, it really makes it happen and the stats speak for themselves…there are just less platic bags out there. They last a good while…but if you put in a few big cartons on Milk and Juice in the same one…they do break (but thats the cheaper ones, like the one pictured on my post) the better ones do last. I would like to know how I could buy a few. We only have black or tan bags here! Janeen – That would be great to pick your own colors. I like the hot pink bags! The ones from the company “Bring Your Own Bag” aren’t sold direct to consumers. You can check their site to see if there are retailers in your area. I am a big fan of reusable grocery bags. They are so nice and durable and I find that I can get more items into a reusable bag then a plastic bag, which means less to carry. The only problem is I generally leave my reusable bags at home and don’t think about them until I’m at the grocery store – oops!